When Victor Oladipo picked up two fouls in the first minute of Game 2, it raised a common question: what is the right way for coaches to manage foul trouble? But the Pacers aimed to give it right back. They have made running a priority in this series — not a surprise given they were the league’s best transition team in the regular season and were facing one of the league’s worst transition defenses. So after LeBron’s made layup, Victor Oladipo turned his eyes upcourt and accelerated. Darren Collison flicked the ball ahead and the streaking Oladipo had it on the run at midcourt. 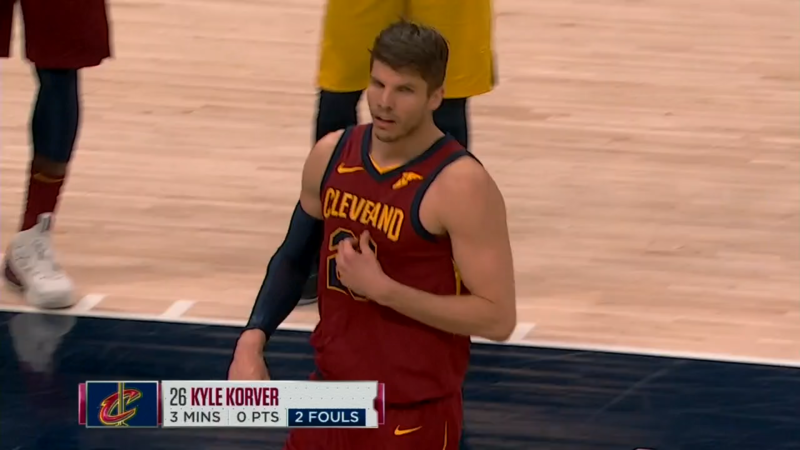 He put his head down and drove to the rim — and right through Kyle Korver. Eric Lewis made the call: offensive foul. The Cavs came back down the court and ran the same set they had scored with on the previous two trips. This time Indiana’s defense stymied the initial thrust, with Thaddeus Young cutting off LeBron’s drive. So James instead turned to hand the ball to Kyle Korver, and then shifted over to screen Korver’s man, Victor Oladipo. Oladipo, tasked with not giving Korver any airspace, charged through the pick, sending LeBron to the ground. Ed Malloy was right there and had no choice but to blow the whistle. Victor Oladipo had picked up his second foul in just over a minute of play. And that presented Pacers’ coach Nate McMillan with a choice: leave Oladipo in, hoping he could remain effective without picking up further fouls, or give him the hook? McMillan chose the latter, following the old rule of thumb: when a player has more fouls than the quarter they’re playing in, they need to sit. Sure enough, Oladipo cooled his heels until the start of the second quarter, and then played until, seven minutes into that quarter, he committed his third foul. The rule was the rule: three fouls, quarter number two, he had to sit. All told, then, Oladipo played only eight first half minutes. He’d play 20 in the second half without picking up another foul. In a game the Pacers lost by 3, losing 10 minutes of playing time from their best player could easily be said to have been the difference. And many did say that, criticizing McMillan’s handling of Oladipo’s minutes and laying the loss at the Pacers’ coach’s feet. When we think through the problem of foul trouble, we first need to understand one key element: the reason a coach takes a player out because of fouls ahead of them picking up their sixth foul is because they are valuing the end of the game more than the current part of the game. A coach will never save a player minutes by pulling them with foul trouble (unless for some reason you believe they’re more likely to foul when in foul trouble — but more on that in a minute).1 Putting a player on the bench by definition limits a player’s minutes, but leaving them in the game only limits their minutes if they do end up picking up all six fouls. So coaches are making a tradeoff: the player will play less in exchange for the ability to control when he plays. The notion of foul trouble is so ingrained in the basketball consciousness, though, that it might take some time for that to sink in. That’s really the entirety of this decision. Managing foul trouble properly is simply a matter of how much a coach values the end of the game. How much are they willing to sacrifice points earlier in the game in order to be assured that they will be able to play the player when it’s crunch time? Historically, coaches have tilted strongly toward valuing the end of the game. That’s where the “one more foul than the quarter” rule comes from: it’s a simple way to keep track of when the player is on pace to no longer be available at the end of the game, and coaches don’t want to faced with a situation where the game is close and one of their best players can’t play. But this may be falling victim to some psychological biases. For one, in certain situations it seems that people irrationally prefer keeping their options open even when there’s a clear, superior alternative. We like the idea of flexibility and don’t want to close doors. When a player fouls out, a coach has a door closed: they no longer have decision-making flexibility. There’s also the matter of not being able to see the alternative scenario. If a star fouls out and isn’t available in crunch time, resulting in a loss for their team, it looks like coaching malpractice — clearly if the coach had managed the player’s fouls correctly, the team would have won. But we don’t know whether the game would have even been close in the alternative scenario. Perhaps if the coach had been more cautious, the game wouldn’t have even been in doubt in the last few minutes, and the star would have been saved for nothing. If that’s the case, and coaches are being too cautious, then they are in effect fouling out their own players. Their best players are playing fewer minutes by the coach’s choice, not because of any rules. The rule only says the player can’t play anymore once they’ve picked up their sixth foul — but who knows if they will even get to a sixth foul? By benching players with foul trouble, coaches penalize themselves before any rule says they have to. And who knows if the game will even be close at the end anyway? Oladipo ended the game with three fouls — he never got near the actual penalty. And yet the Pacers incurred that penalty anyway. The solution, though, isn’t to ignore foul trouble. Because a player’s play changes when he picks up early fouls. This is the primary argument for why the current foul trouble management is correct: if McMillan had left Oladipo in the game with those two early fouls, he wouldn’t be getting Oladipo’s full production. Oladipo would certainly not be the same defensive player, with much less leeway to be physical or to challenge shots at the rim or to swipe in for steals. And he may even be hesitant driving the ball for fear of committing another charge. Give him some time on the bench, though, and when he reenters he can play unfettered. I think that’s true, but I also think that sometimes we forget, as we saw earlier, that foul trouble is a construct. If we didn’t have that rule of thumb about fouls and quarters, players might not be so gun-shy (if at all) with two fouls in the first quarter. After all, they’re still four fouls away from fouling out! Some of that change in play, then, is of our own doing, and could change with different foul trouble management. Another objection I’ve heard to being more lenient with foul trouble is that if the player remained in the game, the opposing team would just go right at them, forcing them to defend poorly or risk picking up another foul. I think this is true to an extent: this, I believe, is behind a lot of the drop in production when playing in foul trouble. And yet something strikes me as wrong about the logic of this argument. If it was that easy to get a player to pick up another foul, why would you wait until he’s in foul trouble to do that? Why not just go at them all of the time to get them in foul trouble? This issue, then, is complex. Complex enough that we should distrust anyone making definitive prescriptions or advocating for black-and-white rules. Not all foul trouble is created equal. Two fouls in the first quarter is very different from four fouls in the third quarter. For one, the fewer the fouls the further the player is from disqualification, and the more uncertainty there is in whether he will actually pick up more fouls. Second, two quick fouls in the first quarter may be the result of a large degree of randomness: after all, it’s only one more foul than we’d think of as normal, and could be the result of a fluke whistle. That randomness would be unlikely to occur four more times. On the other hand, at five fouls, it only takes one fluke whistle for disqualification. The exact type of foul trouble matters. There are a lot of team- and game-specific details that change how we think about this decision. If the player in question has a good backup, taking him out in the face of foul trouble is not as much of a penalty to his team. How foul prone the player is, who the player is guarding, the relative strengths of the teams, how the player’s minutes are managed throughout the rest of the game, and more, all change the analysis of how best to handle these situations. In the face of all of this complexity, though, a coach can’t just throw up their hands. They still need to make a decision. So what’s a coach to do? Have a rule. No hard-and-fast rule is going to properly capture all of the moving parts here, but it is important to have something that’s been studied ahead of time to rely on so in the heat of the game you’re not stuck just going with your gut. Anchor and adjust. But it’s also important to understand what the factors are that went into developing that rule and when they should change. How foul prone the player is, whether they’re a big man or perimeter player, available substitutes, time and score, expectations of how likely the game is to be close, potential matchups — all of these factors should change how to think about how to make this decision. It also matters how much risk you want to take: if you’re a bigger underdog and need all the help you can get, it may make sense to roll the dice and hope they come up in your favor. The idea is to anchor yourself to a rule but adjust off of that rule in various directions as the in-game factors dictate. Be more lenient earlier. Two fouls in the first quarter should not result in a benching for the entire quarter. Four fouls in the third quarter is certainly more worrisome and at that point the decision of how likely the game is to be close should weigh more heavily. Try to rearrange minutes, not limit them. If some of the penalties of foul trouble come from the psychological elements, it may not be necessary to limit a player’s minutes to save them, but just to play them at different times. 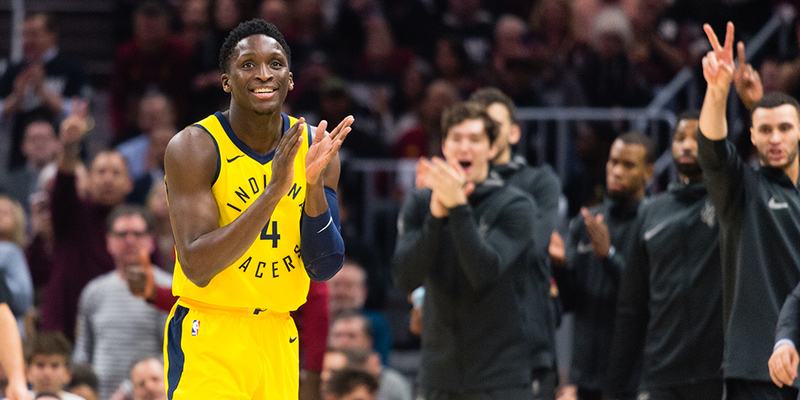 In Game 1, McMillan played Oladipo for all 12 minutes of the first quarter, sat him for the first 5 minutes of the second quarter, and then played him essentially the rest of the half.4 If he wanted Oladipo to play similar minutes, then, in Game 2 he could have benched Oladipo immediately and kept him there for around four or five minutes, then aimed to play him the rest of the quarter, given him a short break at the start of the second quarter, and played him the rest of the half. He may have shaved a minute or two off of Oladipo’s total, but nowhere near the 10 he lost with the current rule, and at the same time, by taking him out immediately, he likely could have avoided Oladipo worrying too much about that third foul or the Cavs targeting him. Coach it. Like anything else in the coaching world, strategy has to be paired with practice. If you want players to be able to play more even after picking up early fouls, it’s important to drill exactly how they should play to minimize any on-court penalties. Teaching technique and practicing how to defend without fouling — on the perimeter, in the post, helping around the basket, in transition, etc. — is a key part of making this strategy work. Rules have value, especially in a hectic decision-making environment like coaching. But we shouldn’t be slaves to them.